Martha's Favorites: TEA CUPS & ANGELS! Wow! What a weekend! I think I cried off and on for most of this weekend. I don't you how you felt about it, but to me it was like 9/11 had just happen yesterday. It was so bad the commercials made me cry. God Bless this great country of ours. To be honest with you I was glad when 9-12 came. A relief that nothing awful had happen to us by some crazy person. I know God says "Let not your heart be troubled", I confess, I like my ducks all in a row. When things are not in my control, I come a part. My family was everywhere but home on Sunday, which made the day even worse for me. There is a Scripture that reads, Martha, Martha, you are worried and upset about so many things, but only one thing is needed and Mary has chosen what is best! I know I have not quoted that exactly, but I wish I was more like Mary. The funny thing is, my middle name is Mary. My heart goes out to all who suffered so much that day. As a Nation, we suffered with them. Moving right along. Hope you are having a great week so far. 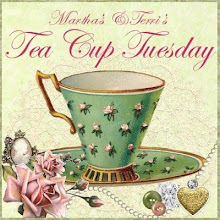 It is Tea Cup Tuesday No. 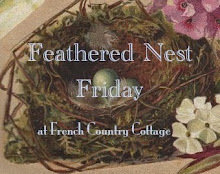 79 and Terri and I are looking forward to seeing all your treasures. I love that I can change my thoughts to what is of no importance, in comparison to what we just re-lived. I thank God for His Mercies that are new every morning. 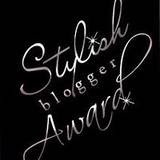 So, Ladies, what did we find that has inspired us this week? I have been in a creative mood this week. 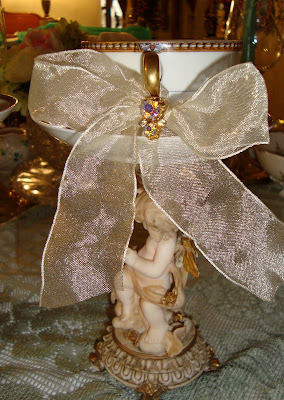 I have made these cute angel candle holders to sell on my website. Didn't they come out cute? I have had these angels for a while. 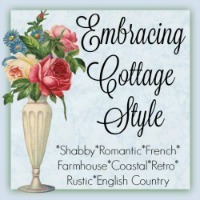 They have been waiting for the perfect, vintage cups. They look so beautiful with the candles glowing. Did I ever tell you I collect Angels? Well, I did, I have stopped now. One day, my husband was counting them and he got tired and stopped. I knew then, I needed to stop too! I still have too many. I have notice that a lot of you have begun to change to fall colors. I think I better get in gear too. I love Autumn, the leaves falling and those amazing colors. Most of all I love the cool temperatures. I am tired of the heat! Here is my first tea cup for this week. 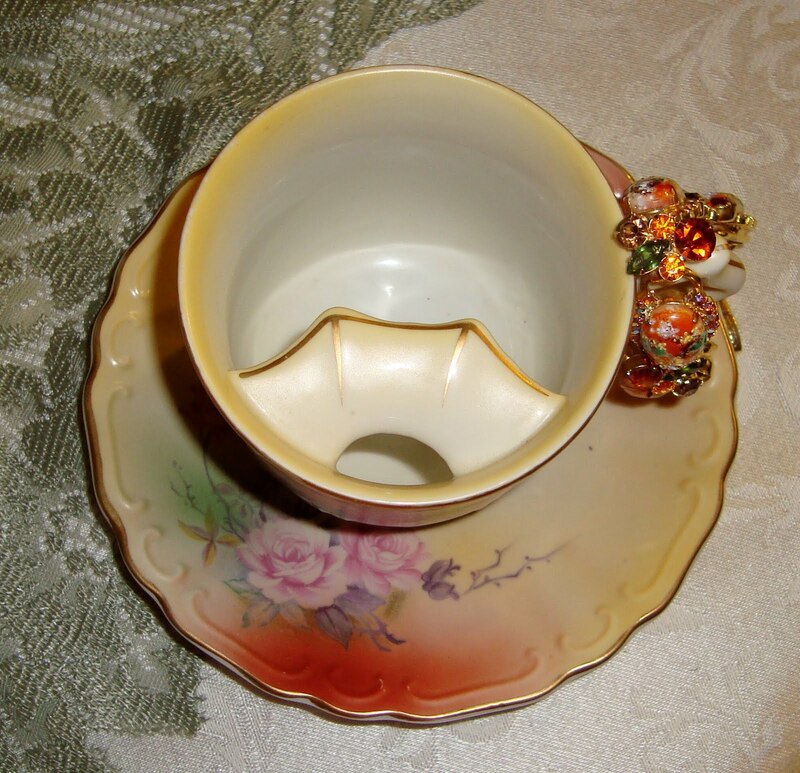 It is a Mustache Cup. It is a R.S. Prussia. I have had it for years. It is strong and sturdy, like a man's cup should be. 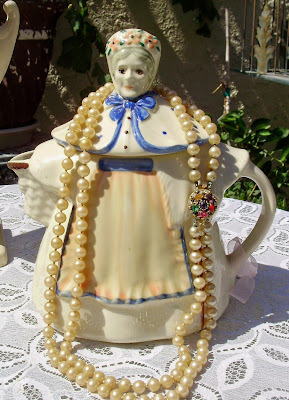 The Old Lady Tea Pot, is English. It belong to my Mother-In-Law. It is special to me because I loved her so. 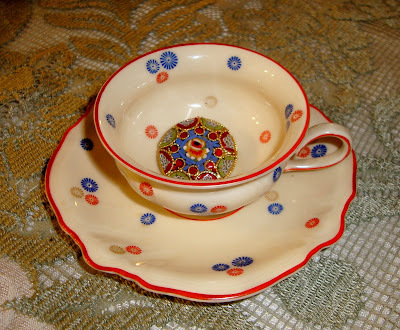 My next cup is R.C Rosenthal, hand signed, Kronach, Germany. It is so 50's looking. The colors are orange, blue and brown with a cream background. They remind me of when I was a little girl. This is a demitasse cup. Beautiful! My last cup is a Noritake. I love the details on this cup. Even the orange looks so pretty. I am not an orange color person. However, it seems that for next few months I am surrounded with those colors. Noah has already complained that I don't have Halloween Decorations up. "Granma, your are late!" I have my orders. Before I say good bye, I have to tell you of another first for me. I am on Facebook (note the button). I am not sure what to do with it. I will learn, so please be my friend on Facebook. My picture looks like Tim the Toolman Taylor's neighbor! (You only see the eyes.) It was a mistake and I don't know how to fix it. I don't know how to post on Facebook either. (I know, I am a piece of work!) I do know I need friends and help! Here is Mr. Linky for this week. Terri is always so faithful and getting it ready for us. By the way, she is teaching a class. When you visit her, check out her class. 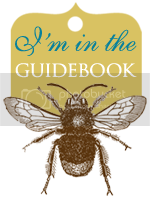 I will be putting a button on my blog in the next couple of days so you can get there directly. Terri is amazing! 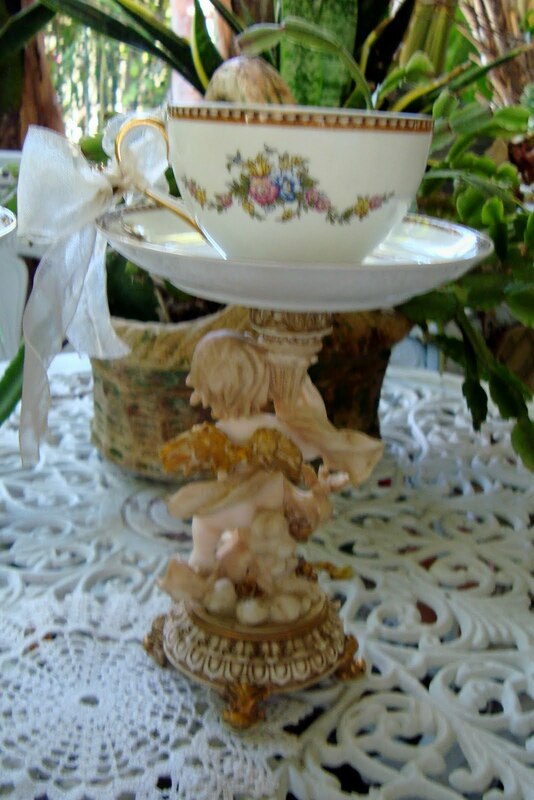 Hi Martha,I love your blog.Is beautiful.Your picture,your cup,teacup and all.For this reason I follow your blog.It inspires me. I wait for you in my blog when you wish.ADIOS!! I love your angels; you really cannot have too many! Your blog is special and so pretty; lovely china--I'm really a sucker for teacups and saucers with roses too. Have a great week. 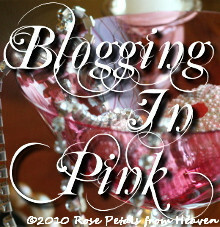 Pretty blog background! 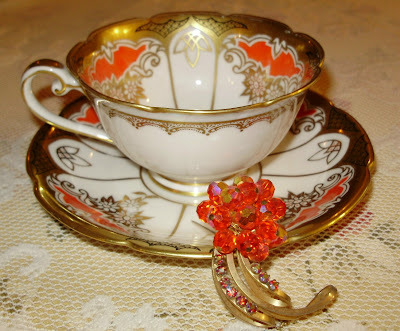 Your cups are wonderful as usual; love the Noritake. Hope you have a lovely week, my friend. OH Martha! Your angel candle holders are adorable! I think they will be snapped up by someone soon. All your tea cups are stunning. I love the demitasse, maybe because of the colors and retro pattern. The tea pot is wonderful too! I hope that you feel better this week and have a real good one. What a wonderful selection of tea cups. I especially like the last one -- it is beautiful! Those days were really hard with all the memories. 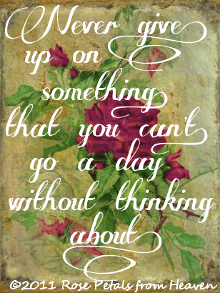 Isn't that amazing that beside all the horro in the world we have good days, too. Lets only count the good days! Your tea cups bring always such a sunny shine and happiness to us. 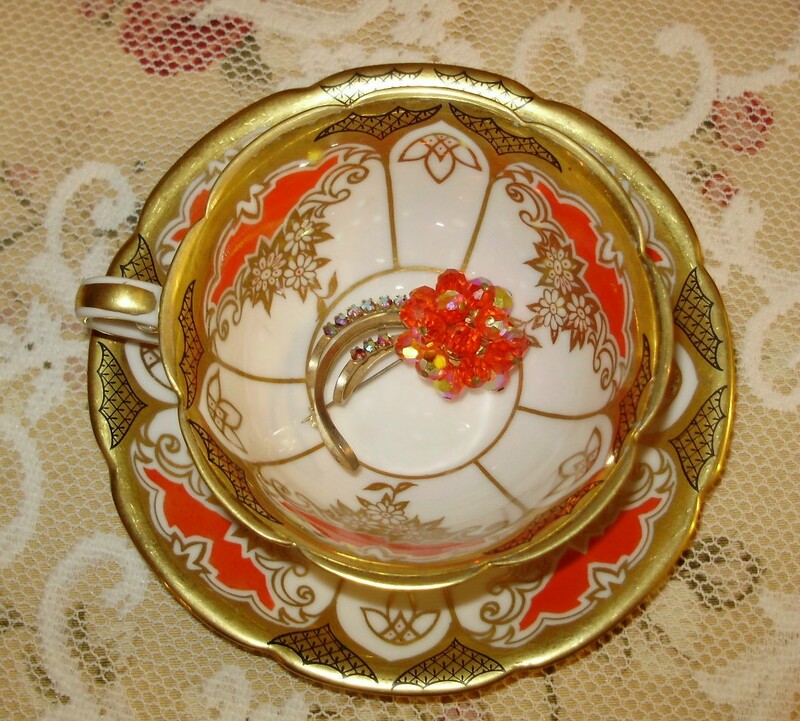 It is a important collection of tea cups over the whole world. 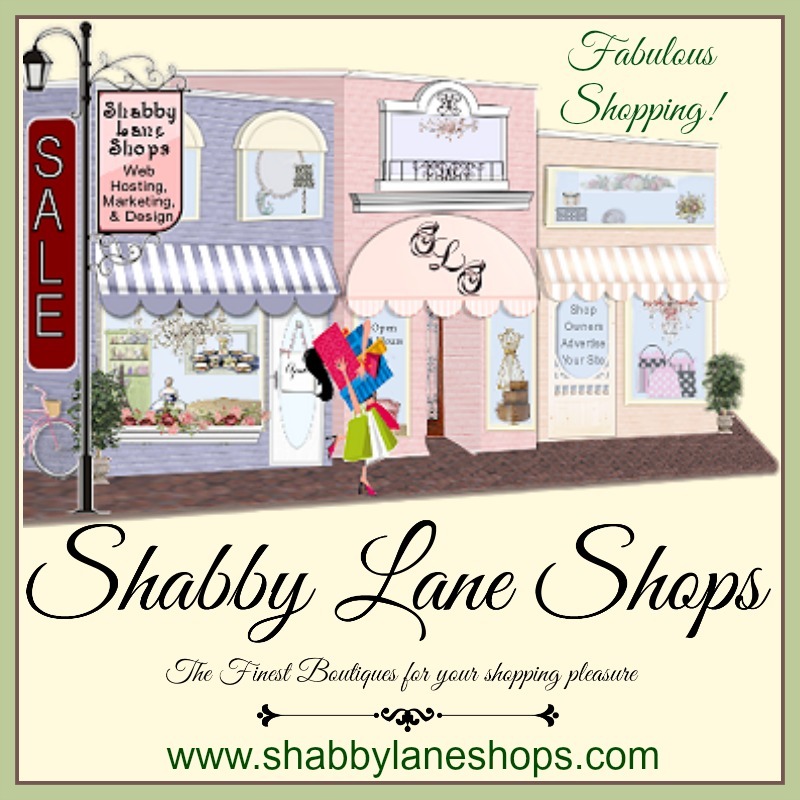 Thank you so much for sharing your treasures and for hosting this wonderful event. Very sweet tea-cups Martha, and I was with you me and my husband looked all the day the television, and yes we were also afraid, but I think the governement and maybe army control it better now. 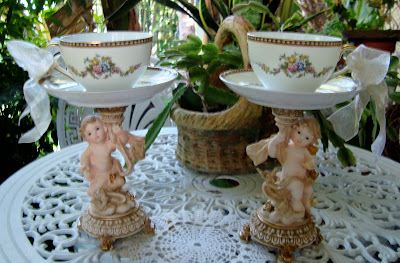 As always, the cups you shared this week are just exquisite...and so are the angel candleholders! Thanks for sharing your thoughts on 9/11. I too was verysad on Sunday, but thankful that there was no incidents on the tenth anniversary of that great tragedy. You have some beautiful china! 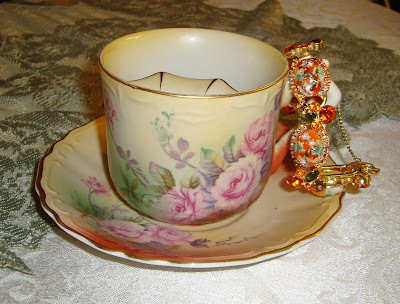 Every week you share such lovely things...the jewelry and teacups go together so well! The music is perfect for remembering the anniversary of such tragedy.Thank-you. 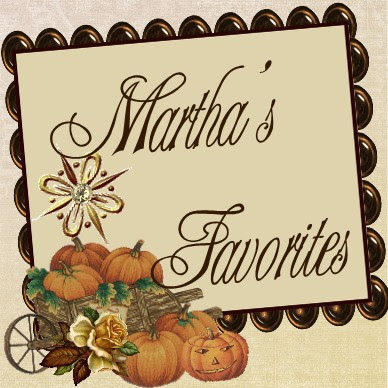 I am always glad I stopped in at your blog to share teacups and read what you have to say.You must be a lot of fun Martha, just reading your own words about yourself make me smile. 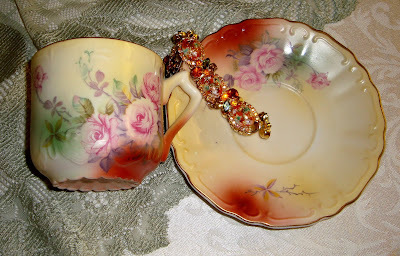 Oh, and the teacups are beautiful, would I expect anything less from you? No! 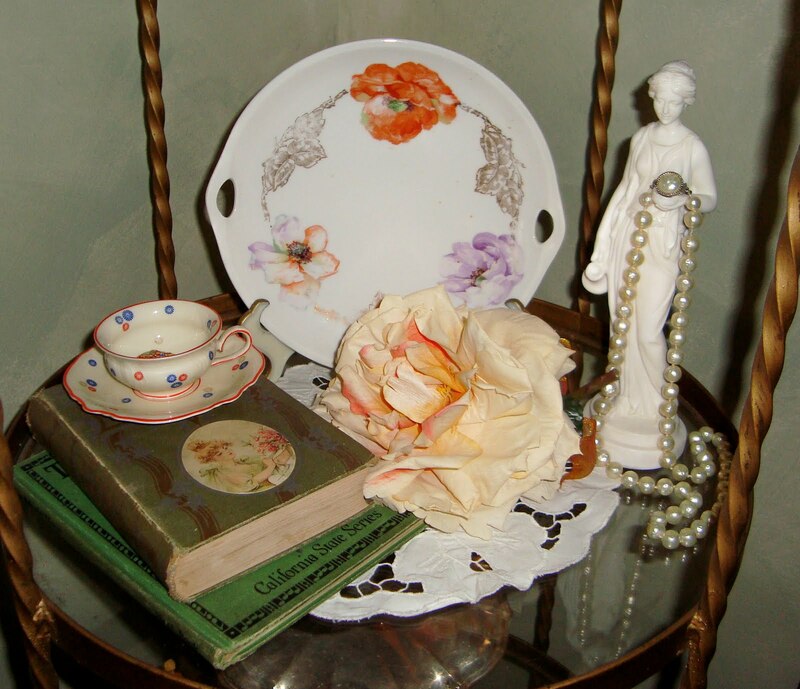 I always love coming over to see your Beautiful Teacups Martha. It was so sad on Sept9/11 for all of us,!!!! A lovely post! It was putting away the summer bits that inspired me to make my first post (cross off to do list!). 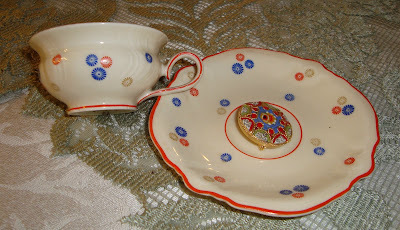 My most special bits of china are RS Prussia but I plan to post about that next week! Your angel candle holders are adorable! I think they will be snapped up by someone soon. All your tea cups are stunning. may be because of the colors and retro patterns. The tea pot is wonderful too! You have lots of beautiful collections.I love your noritake. I can't believe this. I was just thinking of the same Martha/Mary story today. A friend of mine does so much for everyone all the time, and I thought about her. Mary is your middle name? Beautiful. Sometimes I guess you just gotta let life go by and enjoy all the beauty. I really liked this post today. Thank you for reminding me of the story that I have always loved. Oh, by the way, I used to collect angels too. I still have them. Hello Martha.....I was really touched this year with the 9/11 anniversary too. You're so sweet. I wish we lived close by and could actually have a cup of tea together. Your angles are just perfect. 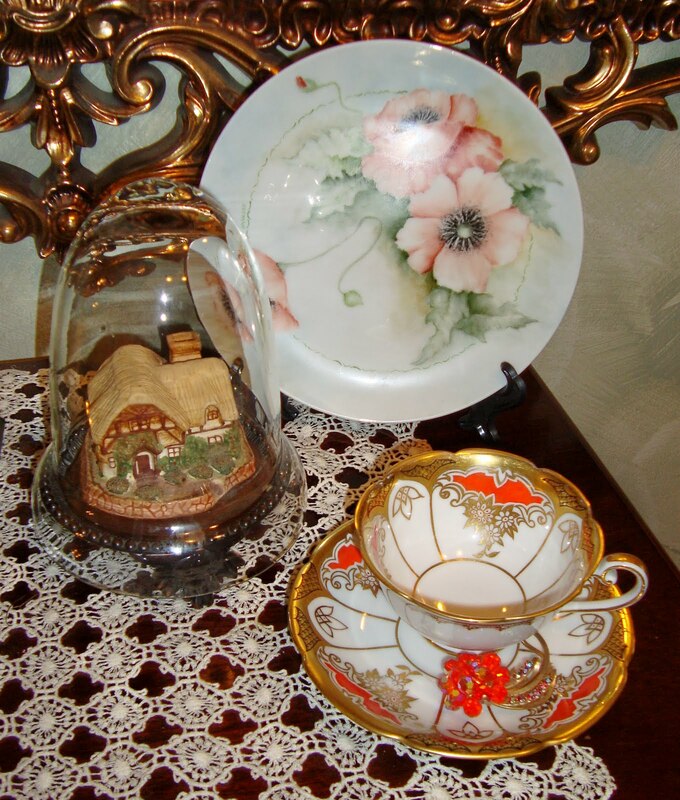 Aloha Martha, beautiful cups and saucers and I love Your lady teapot. I've never heard of a mustache cup, so very interesting. 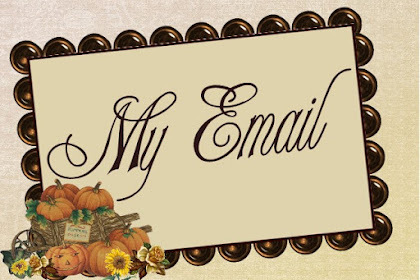 I learn so much from your blog and Terri's blog. Have a great week! Warm hugs to you. Martha, Your blog is very beautiful. 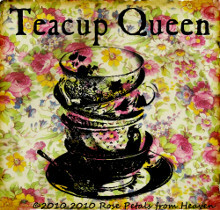 Your picture, your cup, teacup and all are great. For this reason I follow your blog. It inspires me. Those angels are gorgeous. But here's the thing. Donald Trump isn't running for president. Donald bodybuilding shirts Trump was colin kaepernick t shirt never going to run for president of course he wasn't. Under medical supervision, these stimulant drugs are quite safe and do not make the child feel "high", although they may feel slightly different. cat middle finger shirt To date, there is not convincing evidence that children risk becoming addicted to these drugs, when used for ADHD. In fact, a study at Massachusetts General Hospital and Harvard Medical School found that substance abuse rates were lower among teenagers with ADHD who stayed on their medication than those who stopped. DRESSED UP IN TEA CUPS! 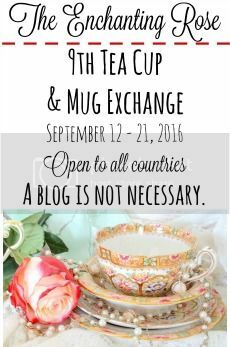 TEA CUP GIVE AWAYS AND DECORATING FALL STYLE!